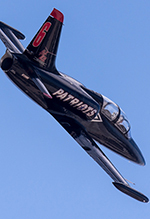 Recognised as one of the largest military airshows in the United States of America, the annual MCAS Miramar Airshow is naturally a highly anticipated entry in the calendar. Representing one of the few events where all the types operated by the US Marine Corps can be found on display - the majority in the air - Miramar is popular with the international enthusiast too. 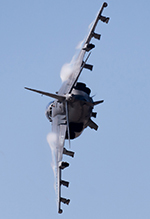 With both the Harrier and F-35B participating in the flying display; was the 2015 event a classic Miramar? Andy Evans concluded his recent tour of the West Coast and spent two days as a guest of the USMC. Photography by the author, Keith Meachem, David Gavin and David Ilott. 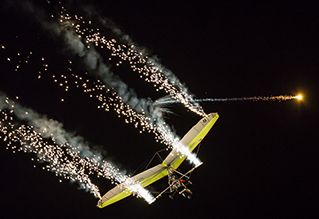 Held over the weekend of Friday 2nd to Sunday 4th October, the 2015 Miramar event followed its traditional format of a three-day event including a night show on the second evening. As with every military airshow in the USA, entry was free (as was the show programme) but the best viewing locations were then available for purchase either in advance or on the day. Nevertheless, the long flight line at Miramar meant that everyone could get a good view no matter where they sat. 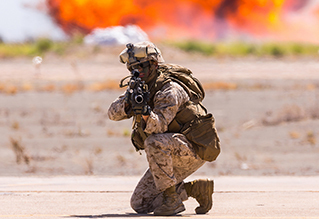 During the daylight flying displays, the centrepiece of any Miramar airshow is the Marine Air-Ground Task Force (MAGTF) demonstration, yelled energetically to the crowd as the 'MAAAGTAFFF!' Designed to highlight how a USMC Task Force would assault a target, 2015's demonstration involved both air and ground assets in a scripted sequence to pyrotechnics. 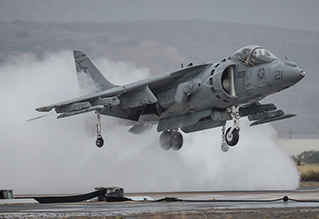 The sequence commenced with multiple simulated reconnaissance and bombing runs performed by a pair of F/A-18D Hornets and AV-8B+ Harriers who then moved off to 'refuel' from a circling KC-130J whilst a pair of AH-1Z Vipers undertook strafing runs. The beginning of the ground element was heralded by the arrival of a pair of UH-1Y Venoms escorted by the Vipers delivering Scouts to the battlefield who quickly called in further air strikes from the circling combat assets. After the Scouts were rapidly extracted by rope hanging from the Venoms, further airstrikes signalled the arrival of the main ground force inserted by a trio of MV-22B Ospreys, and their vehicles by CH-53E Super Sea Stallion. The inserted troops then proceeded to advance on the crowd whilst USMC Armour parades along the runway and crowd line. The sequence culminated with a parade in review flypast by all air assets involved. The MAGTF demonstration may have shown the crowd what the current USMC can do; but what about the capabilities coming in the near future? 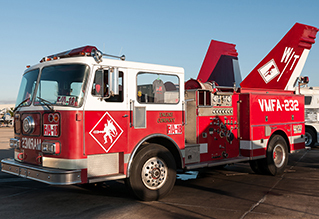 The stage was quickly handed over to VMFA-121, the Green Knights. Based at MCAS Yuma, VMFA-121 have the honour of being the first operational combat F-35B Lightning II squadron in the world. During a short demonstration, the Green Knights gave a taste of the controversial fighter's capabilities. Kicking off with an energetic take-off, the display consisted of a number of fly-bys before transiting to a high-g turn. 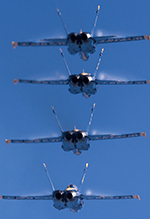 Things then slowed down with a pass in hover mode before the aircraft was bought to a complete stop in front of the crowd whilst performing a pirouette. 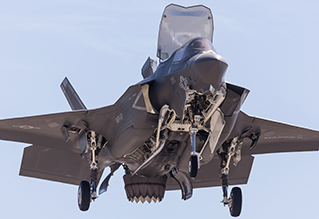 The display gave many their first view of what the F-35B can do and what its capabilities might be - in particular, the innovative hover system and the potential of the highly advanced sensor systems. However, the demonstration of its turning capabilities was less than awe-inspiring - with a turning circle more akin to a Phantom or Tornado. Not to be outdone and rounding out the military solo displays was the current king of the hovering jet fighters and - for the watching British visitors - a trip down memory lane. Showing the F-35B that it isn't by any means the only asset with these capabilities, the USMC also provided their solo AV-8B Harrier display to wow the crowd. Somewhat limited compared to RAF displays of old and lacking a bow, it was still a very welcome sight to see one of these legendary aircraft in the sky once more. Even more surprising was the news that the pilot was a Royal Marine - Major Mike Carty - only the fourth Royal Marine ever to fly fast jets and currently serving as Executive Officer on exchange at VMFA-211 where he has flown combat sorties against ISIL as part of Operation Inherent Resolve. As surprising was his unenviable call sign, 'Princess'! The star display team at any Miramar Airshow are the US Navy Blue Angels who, as ever, provided their awesome dynamic display to a very appreciative crowd. They were, however, not the only display team present this year. Despite operating the same aircraft, the L-39 Albatros, the other two teams participating were poles apart. Approaching the end of their (now extended into 2016) 2015 American Tour, the Breitling Jet Team were made to feel welcome by the crowd as they performed their signature aerial ballet. Making their presence also known were the Patriots who consist of former Thunderbirds, Blue Angels and Snowbirds pilots. Their display is far more aggressive that the Breitlings, significantly more dynamic and lower. So low, in fact, that their opposition passes were obscured from the raised media photography platform by the commentator's shelter! These two teams were great proof that operating the same type doesn't mean a similar display. 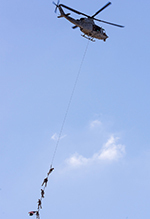 The Breitlings and Patriots were not the only civilian acts to wow the crowd. 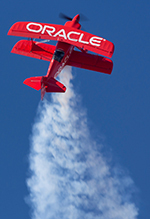 One act that seems to appear at nearly every major airshow in the US is Sean D Tucker in his Oracle Challenger III, and Miramar was no different! Displaying no less than three times in one day, his unique blend of low-level high-energy aerobatics never get boring. Also, providing a tribute to veterans of the US military, Steve Stavrakakis performed his gentle aerobatics in his IAR-823. What makes his display so unique is the music it is choreographed to, which includes a little girl talking about her father who has gone to war - you cannot help but well up towards the end of the display. Steve then went head to head with Dan Buchanan in his hang glider for a scripted sequence before Dan began his solo routine which was quite energetic considering what he was flying! The civilian acts were then completed by the AT-6 Texan "Wardog" which, after being put through a solo routine, proceeded to race the Shockwave Jet Truck down the runway. The evening show followed hot on the heels of the day show and saw many of the civilian acts once again display. This time, many made use of the darkness to add fireworks and pyrotechnics to their displays to give them added flair! The military were not to be outdone with the inclusion of twilight displays from the Blue Angels Fat Albert, the US Army Golden Knights Parachute Team and 'Princess' in the Harrier. 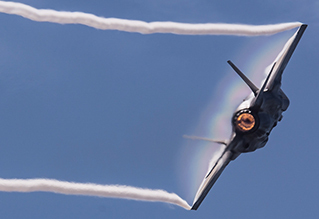 After a fun sequence involving the famous Robosaurus, the displays came to a close with afterburner passes from a Hornet, which had been advertised pre-show to have been an F-35. The evening show then ended with the signature Miramar wall of fire - the heat of which can be felt anywhere on the showground. Of course, no airshow of this size is complete without a substantial static display. Much of the static was provided by civilians - including a number of interesting warbirds - however there was also a touch of international style provided by a pair of Luftwaffe Tornados attending the show from the Holloman training detachment. Six American forces (Navy, Air Force, Marine Corps, Coast Guard, Homeland, NASA) were represented in the main static park with a variety of helicopters, fighters, bombers and transports including the imposing B-52, the rare NASA F-15, and the gold/black Homeland Blackhawk. One irritating feature of US military airshows is the lack of barriers. This may initially sound great to the European enthusiast (not having to negotiate ropes or barriers to take your photos) but there is a massive negative that is far more annoying. It is regularly hot at US airshows and the public will often set up their chairs under the wings of the aircraft or in the shade of the fuselage. Unless you wait until the end of the day or gain early access it is impossible to obtain good shots of static aircraft. That said, there was one static aircraft with barriers and that was predictably the F-35B - not even the highly-classified E/A-18G Growler on static had barriers surrounding it. The unique aspect of Miramar's static is Squadron Row where many west-coast based units set up shop to meet the public and to sell their merchandise. If you collect patches or coins, you will be in heaven - it is also worth noting that a British accent goes down well with the wives of the squadron which can result in a few rarer items being up for purchase too (coins and patches before comments are made)! MCAS Miramar Airshow has a fantastic reputation; one that the 2015 event certainly upheld. The flying display might be towards the sun but the action on show is well worth the challenge. If you are looking to make a list of US airshows to visit, Miramar is a must. Andy and the two Davids would like to extend their thanks to Captain Salinas and her team for their hospitality and assistance during their visit; they wish everyone at Miramar the best of luck in the future. 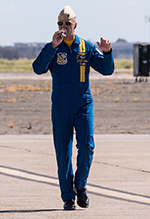 On 21st October 2015, whilst returning to the USA from a deployment in support of Operation Inherent Resolve, Major Taj Sareen of VMFA-232 tragically lost his life shortly after departing RAF Lakenheath. Our team met some of the Marines of VMFA-232 whilst at Miramar who were all welcoming and friendly. UK Airshow Review would like to dedicate this review to his memory.